The calculated advance milk price in April 2016 averaged € 26.29 per 100 kg standard milk. A decrease of € 1.15 compared to the previous month. Compared to April 2015, this is a reduction of € 4.79 or 15.4 %. The calculated milk prices in April fell by about the same amount as in March. With the exception of Irish Glanbia all companies reduced their milk prices. The milk price of British Dairy Crest fell most, largely as a result of the seasonal levy in April. The second largest reduction was the milk price of Italian Granarolo (minus € 1.9). For the coming months further price reductions are announced. The guaranteed milk price of FrieslandCampina decreases in May with € 2.5 and remains unchanged in June. Arla milk prices are reduced with € 1 in May and € 1.3 in June. Other price reductions relate DOC Cheese (and DMK) with € 2.1 in May and €1 in June and Dairy Crest. The latter dairy decreases the milk price by 0.3 pence per liter (ppl) in May and 1 ppl in June or a total of about € 1.5 per 100 kg standard milk. New Zealand’s Fonterra announced for the new 2016/17 season, which starts in June, an opening forecast price of 4.25 NZD per kg fat and protein. Including an estimated dividend of 0.5, the milk price is 4.75 NZD or € 21.93 per 100 kg standard milk. This price is above the expected milk price for the current season (4.40 NZD), but is still much lower than the price of milk in the previous years. Price changes in April 2016 (€ 100 per kg compared to the previous month) and additional information per company. Milcobel: -1.0. The supplementary payment for 2015 deliveries is corrected from € 0.49 to € 0.47 per 100 kg. Lactalis: – 0.9. The volume bonus (specialization premium) has been corrected retrospectively so the milk prices are reduced with € 0,34 per 100 kg. Sodiaal (A-price): -1.0. Retrospectively the calculated milk prices are increased with € 0.21 per 100 kg based on the so called ASAP premium. Assumed is the farmers get on average this amount for forecasting future milk deliveries. Dairy Crest: – € 4.2 for a large part due to the seasonal levy, May and June respectively -0.3 and -1 pence per liter or in total about € 1.5 per 100 kg. Glanbia Ingredients Ireland: unchanged. The milk price is exclusive of coop support (1.9 cent per liter). Kerry: -1.5. Kerry made an additional payment of 0.6 cent per liter including VAT for 2015 liters delivered. This amount is retrospectively included in the 2015 milk prices. Emmi: – 3.1 due to lower A- and B – prices and a higher seasonal levy. Milk prices of 2014 are adjusted based on an additional payment of € 0.07 per 100 kg. USA: – 0.9 due to the exchange rate and a slightly decrease of the milk price. The US Class III milk price decreased from to $ 13.74 in March to $ 13.63 per hundredweight (45.36 kg) in April. The growth of milk production in northwest Europe weakened slightly. Despite the slightly lower growth rate in Europe the increase in global milk surplus still is mainly a European issue. Milk production in the US is also increasing, although in April the growth was lower than in February and March. In Oceania, the milking season is almost over. Australian milk production slowed down because of adverse weather conditions. The New Zealand milk supply also decreased. However, the decline was less than expected. The market seems currently slightly more positive. There is an upward correction in the market, which moved too much downwards in recent months. 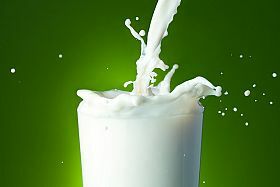 The bottom was reached in mid-April, after which the dairy quotations increased due to a slightly weaker than expected growth of supply and an increase demand. Much skimmed milk powder is sold for intervention. Meanwhile the new ceiling of 218,000 tons is reached. In June purchase by tender will be launched. 6 mei 2016 | Compare milkprices FrieslandCampina, DOC, Milcobel with Danone!